At the tab header, click the Add icon. Click New horizon. 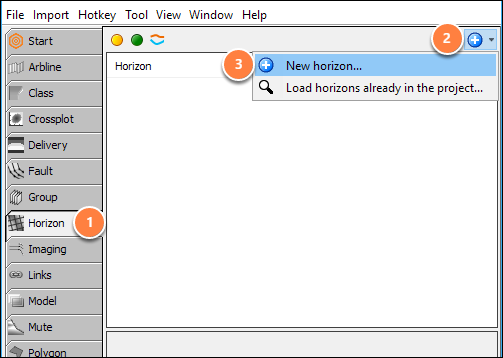 The Configure Horizon window will be displayed. Enable the Shared check box to make the horizon visible to other users. Click Configure Sampling to configure the IL/CL spacing of the horizon before picking. If this is not specified, it will automatically use the spacing of the first volume picked. To pick a sparse horizon (for performance or memory reasons), increase the increments before picking (see Configure IL/CL increments for a horizon). To pick a gather horizon (for example, a horizon picked on IL/CL and offset), choose the gather dimension to at Gather . This dimension should match the gather dimension (i.e. offset, angle, frequency) of the gather volume you will interpret. At Domain, select the vertical domain (TWT or TVDSS). Enter comments or descriptions for the horizon in the Notes. Click OK. A new horizon will be added in the Horizon tab. 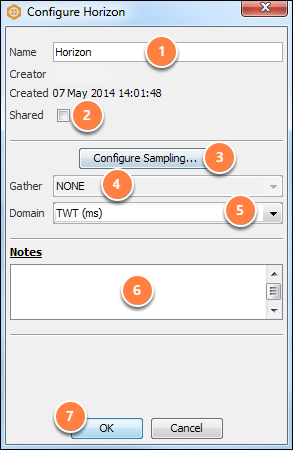 In the Configure Horizon window, click Configure Sampling. The Configure Increments window will be displayed. 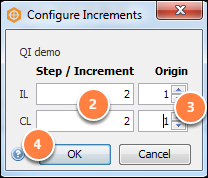 Under the Step/Increment column, type the IL and CL increments for the new horizon. If you have configured IL/CL increments that are greater than 1, you can configure the IL/CL Origin. For example, if you configure an IL increment of 2 and set the origin at 0, the horizon points will be located on even inlines. However, if you set the origin at 1, the horizon points will be located on odd inlines. Click OK once you have completed the increments configuration to exit the Configure Sampling window. Tip: Click the Help icon to read more about increments settings.